Make nice with spice. Part 1. Really flavoursome food, requires really flavoursome ingredients. Freshly picked and respectfully grown fruit, vegetables and herbs, meat from animals fed and treated well from birth to the slaughterhouse and minimal messing with nature. The usual things I preach about. Something I don’t mention as much though is the spice factor. If you have a pantry full of old jars filled with old herbs and spices, throw them out. Really. They add nothing to the flavour of your meals. Firstly, the convenience myth. You can have a pantry well-stocked with your favourite spices in unground form. Buying your spices whole will extend their shelf life a long way. As a general rule, the harder the spice, the longer it will last. Keep your spices in air tight containers in a dark corner of the cupboard (or non see-through containers) to maximise their shelf life. At the point where the aroma no longer hits you when you open the container, throw them out. Really. Bear in mind here that I am somewhat neurotic about food budgeting and waste and still I say, throw them out. Whilst your large supermarkets are unlikely to sell a decent range of whole spices, they are easy to access. I buy mine from a mixture of places depending on the time I ave available, what else is on my shopping list and where I am going. I buy from food wholesalers, Asian grocers, Indian grocers and online. I can recommend from experience Aussie Spices, they have an excellent range and free delivery throughout Australia! What could be more convenient? Whole spices are no more difficult to use than they are to procure. If you have a thermomix, simply throw in all the spices you need for a given recipe and blitz on high until the spices are ground. 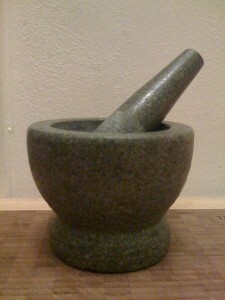 If you do not have a thermomix, all you need is a decent sized mortar and pestle. No kitchen should be without one. It is just as quick as using the thermomix and for finely ground sizes, even more effective. I will often grind up 2 – 3 times more than I need of a commonly used spice so I have enough ground to last me the week. No longer. In case you’ve ever wondered, the mortar is the bowl, the pestle is the big fat stick thing. Now stay tuned for part 2 in which we will begin to explore the essential spices of The Kitchen Playground.